Dr. Jeff Boehm joined The Marine Mammal Center as its Executive Director in 2008. He was formerly the Senior Vice President of Animal Health and Conservation Science at the John G. Shedd Aquarium in Chicago, where he worked for 16 years. There, Jeff oversaw the veterinary medical program and led and coordinated the aquarium’s conservation science division, including conservation partnerships, in-house programs, and educational and advocacy programs and partnerships. Jeff traces his career path back to a volunteer position he held at the Center back in 1980. As is the case for many current volunteers (there are more than 1,200 on the Center’s roster) or staff members, the Center experience influenced him greatly. For Jeff, the opportunity to work with incredible wildlife in the context of conservation inspired him to pursue a nontraditional route in veterinary medicine and led him, ultimately, back to The Marine Mammal Center. The Marine Mammal Center in Sausalito, California, is a nonprofit veterinary and teaching hospital for marine mammals. The Center is authorized in its work through the Marine Mammal Health and Stranding Program of NOAA Fisheries. 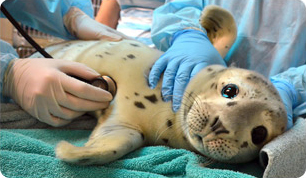 Since its inception in 1975, the Center’s volunteers and staff have cared for more than 20,000 seals, sea lions and other marine mammals, all of which were rescued along a 600-mile stretch of California coastline. Patients at the Center suffer from malnutrition, infectious diseases, toxicities and even cancer. In addition, about 8 percent of the patients are under care because of human actions and carelessness, such as marine trash entanglements and shootings. The core work of the Center is diagnosing the illnesses of these patients, nursing them back to health and releasing them to the ocean. Built on that central focus, the Center’s mission also includes robust science and education programs.